Now you can take eBay along! The eBay mobile app is especially helpful at a garage sale to see how much you can sell an item for — and to find out how many people are selling an item. If you prefer a different view, you can go to eBay on your phone’s browser to see a mobile enhanced version of the site. The eBay mobile app is available for download on smartphones: iOS (for the iPhone, iPad) and Android. If you don’t have one of those operating systems on your smartphone, you can always type the address above into your mobile browser. The experience is exactly the same on a tablet, but a tablet’s screen gives you a lot more real estate to use. This is especially beneficial if you want to list an item for sale. If you’re out and about and find an item you think might do well on eBay, you can easily search for the item by tapping the text box next to the magnifying glass on the app. Your mobile keyboard will pop up and you can type in the keywords for the item you’re looking for. Inside secret: Once you tap in the text field on the mobile app, you will also see a tiny microphone. Tap there to input your text from speech. There is also an icon that looks like the lines of a barcode. This is a scan option. 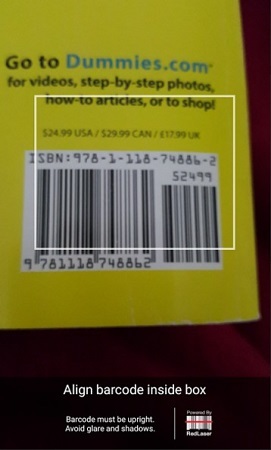 Just tap there to scan a barcode on an item to see whether that item is being sold on eBay. Search for items by typing keywords, or tap the text field to activate the barcode scanner. The mobile barcode scanner is very fast and accurate; you will get the results immediately. Then you can further refine your search to Sold items only to see at what price that item is currently selling. When you’re starting out on eBay, it’s a good idea to list your eBay items for sale from your laptop or desktop computer. The text-formatting features available on the website’s Sell an Item page (such as bulleted lists and boldface) are harder to use on the mobile app. The app does have an HTML description writer, so if you learn the little bit of HTML code, you can give your descriptions a little extra character. Since many tablets come equipped with a great camera, you can list from your mobile. However, you may want to pay extra attention so you don’t miss out on any detail. You can start your mobile listing by writing a title, adding some details, and uploading the photos. You can complete a good portion of the listing on mobile, but you may want to click Save and then reopen the listing as a saved template on your computer. Once you’re on a computer, you can search eBay more efficiently for top-selling keywords and pricing ideas. A listing started on a tablet with the eBay Mobile App. If you do complete a full listing on the mobile app, you may still want to go to your computer and buff up the look of the description. Never forget: The purpose of your listing is to sell the item. So, as with a lady’s makeup, dolling up plain text (tastefully, please!) goes a long way toward making your item more desirable to a buyer.